LAS VEGAS — Designer and lifestyle expert Jennifer Adams says that even before she designed her own rugs with Jaipur, the manufacturer was always one of her favorite companies. 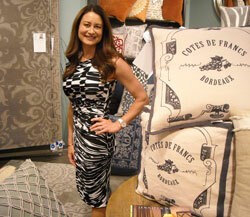 Adams, who is a regular on “The Better Show” and has a number of home accessories products ranging from top-of-bed to designer fabric, was in Jaipur’s Las Vegas showroom during the July 27-31 market for the official launch of pillows, poufs and rugs from her Jennifer Adams Home brand. Adams said she takes her design cues from European sensibilities, specifically French Provencal style. While blues, oranges and purples take center stage in many of her products, she said the tones are muted, so they can be both trendy and timeless at the same time. She said having the offerings from Jaipur — including 12 rug styles and 25 pillows — helps her tell a more complete design story when paired with her other products. After the Las Vegas Market, Jennifer Adams Home announced that its spring 2015 bedding collection from partner PEM-America will be introduced at the New York Home Fashions Market on Sept. 15.